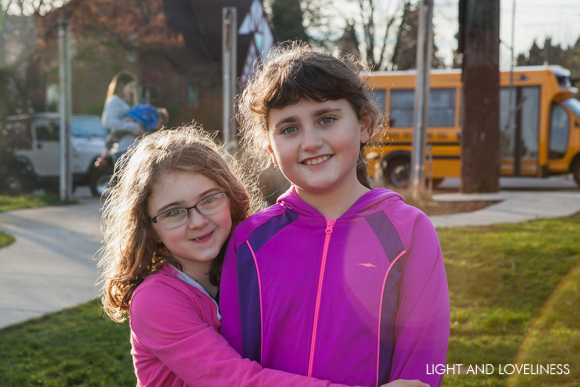 Have you ever seen so many happy faces in the sun, in January, in Seattle? We are all excited to be starting off a new year of adventures, and the grandparents will be happy to know that I’m continuing my one-photo-a-week challenge, this time with the focus solely on the kids. Here we have a little snap from a day at the park earlier this week. We couldn’t pass up the invitation of some of our favorite friends to join them for playground fun. 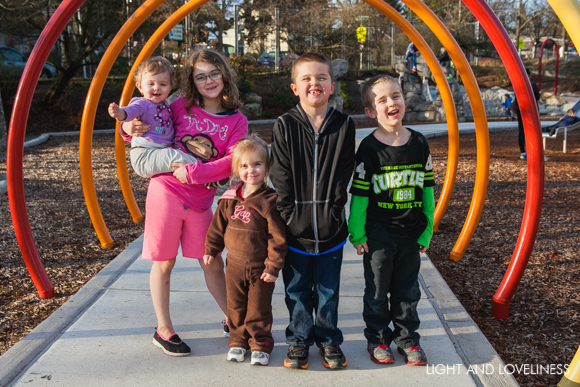 Park playdates are not the norm for this time of year, and it was an extra-special afternoon. Also, #2’s gaping tooth hole makes a grand debut, so don’t miss that. Gotta love the goofy smiles. Below is my oldest with her greatly-loved friend. These two are cut from the same wacky-awesome cloth. They both have creativity coming out their ears. Do you make goals? I’d love to know what you’re dreaming about doing in 2015. What is new with you?